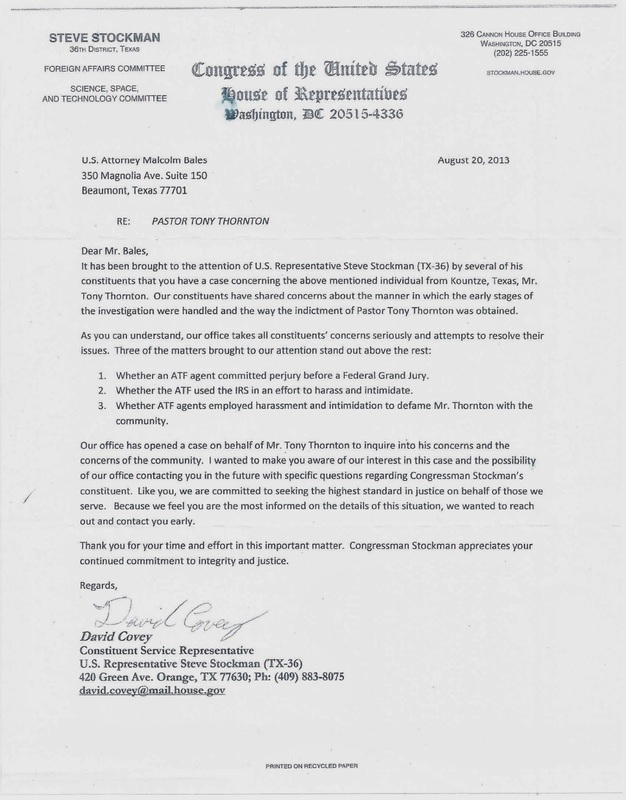 An ATF agent, Tom Harm, is being investigated for allegedly using the IRS to target a Kountze, TX pastor, Tony Thornton. Harm, a former IRS agent, was caught on a recording telling Mr. Thornton that he is going to snoop around in the pastor’s finances and taxes. Next thing you know, Mr. Thornton’s personal, business and ministry tax returns were all three hit with audits at the same time. Where did at least one of the audits come from? None other than that corrupt Cincinnati, Ohio IRS office that is now famous for targeting conservative groups. The audits all came back clear, but the point is that if it is true that Mr. Thornton was targeted by the IRS via this ATF agent, and the evidence suggests that it is, then this is a HUGE problem. It is illegal and must be stopped. This is not just about a local pastor and an ATF agent. This is about the ATF having the ability to get the IRS to target anyone they want with an audit. This is one of the big reasons that Congressman Steve Stockman’s office has started an investigation. Regardless of what you think about the pastor, if the ATF agent can target this pastor then who else has he and will he target using the IRS? Who knows, maybe I will be targeted next because the ATF agent does not like this article I wrote? 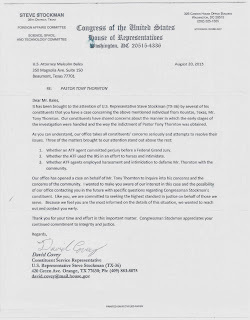 At the end of this article you can see a copy of the letter that Congressman Stockman sent to the U.S. Attorney’s Beaumont office regarding the possible problems with the ATF and IRS in this case. The previous U.S. Attorney in Beaumont before this current one could not get any indictments against Thornton because the proof was not there to back any case against Thornton. Now with evidence of wrongdoing by the ATF agent and the IRS, the current U.S. Attorney in Beaumont might just have to drop the case. They have already pushed the case back several years. The Kountze, TX Church Fire – Accusation of a Rouge ATF agent lying, committing perjury, spreading rumors, etc. In addition to using the IRS to target people, there is also evidence that this ATF agent committed perjury to the Grand Jury in order to get an indictment, spread false rumors, and used his position to oppress members of the East Texas community of Kountze. Heck, the ATF agent even was asked if the interviews with Kountze community members were being recorded and the Agent said no, but then a court ordered the agency to turn over all the evidence and sure enough the meetings with community members were being recorded and the ATF agent is heard in his own recording telling Kountze community members that they were not being recorded. Again, regardless of what you think happened or did not happen in Kountze, TX, it is wrong for any government agency to act above the law and violate the rights of people. If they do it to this pastor then they can do it to you. I love the community of Kountze and I loved the church community at First Baptist. It was tragic what happened and I want the truth to come out too. That being said, the community should not have their rights trampled on by the government using unlawful tactics. Here is how it all started. Several years ago, the First Baptist Church in Kountze, TX burned to the ground. The ATF comes in to try to find out what happened. They go around town spreading rumors and intimidating people by telling them things like “they are not allowed to tell anyone they were talked to and if they do then the ATF will know.” The intimidation was not getting them anywhere so they then start spreading false rumors such as saying that the Pastor was having an affair with his secretary. A local county official asked the ATF agents why they were saying these blatantly false things and the ATF agent replied and said that they were starting the rumors to stir the community and see if someone comes forward with something true. This of course is outrageous. I respect the ATF’s job of trying to find out how the church burned down, but the government cannot intentionally spread false rumors and intimidate people like this. I suppose it is not all that surprising that the ATF did this considering the ATF allowed thousands of weapons to be sold to Mexican Drug Cartels, and one of the weapons was used to kill a border patrol agent Brian Terry. Pastor Thornton was the President of the Hardin County Disaster Relief Fund. There was some controversy surrounding this non-profit disaster relief group. 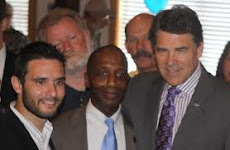 Philip Klein of the Southeast Texas Political Review came up with the idea that this group’s secret documents were stored in the church office and so the Pastor must have burned the church to burn the non-profit’s documents. I am currently supporting and writing about Klein’s employee Stephen Hartman who was illegally arrested trying to serve lawsuit papers to corrupt Jefferson County Judge Layne Walker. I cannot support Klein’s belief that the church was burned down because of documents in the church office. How can I be sure? I know there were no documents in the church office because I used to go to First Baptist Church and I worked with the youth group and was in and around every part of the church office. There were no secret rooms with documents. The ATF of course found NO EVIDENCE at all that any documents were stored in the church. They have found NO EVIDENCE that Pastor Thornton was at all involved in the church burning. They have not even provided any reason why they believe the church burning was even arson. No one has been indicted or charged in connection with the church burning. The ATF agent did not want to walk away from the investigation empty handed though, so he started looking at the Hardin County Disaster Relief Fund. Sure there were some problems with the fund, but it had nothing to do with the fire. One of the contractors sending invoices to the fund for repairs to hurricane damaged homes was discovered to have sent some invoices in even though no work was done. When Pastor Thornton and the group’s board found out, they took action and put a lien against the construction company to recoup the funds. The Disaster Relief fund no question should have done a better job of making sure the work that was supposed to be done was getting done. Out of hundreds of homes though, most of the money in the fund went to actually help the hurricane victims who needed help. There were even a few who lied on their application to get disaster funds and said they had no money even though they made nearly 100,000 bucks a year. Unfortunately, that happens in all areas of government and it should be cracked down on everywhere, not just in regards to this disaster fund. Then there was the allegation that it was illegal for some of the materials that the fund purchased had come from Pastor Thornton’s lumber company. This turned out to be a non-issue because Pastor Thornton had denied anyone being able to buy lumber from his yard with Disaster fund money unless the board and State of Texas approved it. The State of Texas sent Pastor Thornton a letter stating that it would not be a conflict of interest and the Board approved it. Even then, materials with the Disaster group’s money were purchased from several different lumber yards, with Pastor Thornton being only one of the many places where materials were purchased. The ATF agent saw this letter from the State and he said that he does not care if the State of Texas said there was no conflict of interest because he is the Federal Government and can trump the State. Then lastly, there was one true mistake that Pastor Thornton made. Pastor Thornton’s wife was dying and it was expensive. Thornton made the bad decision to take some money out of the disaster fund to pay for his wife’s medical bills. He paid back the money with interest before anyone found out and then he admitted and apologized to the disaster fund board for what he had done even though they would have never had caught him. This was all before any investigations happened. I am not defending these actions. There is no question that this was not the right thing and a big mistake and it would have been stealing had it not been for him paying it back, regardless of the reason Pastor Thornton had to take the money. With the money paid back and the board taking the matter into their own hands and handling it internally, there was no evidence to prosecute for stealing money because, before any investigation, the money was put back. I am not writing this article to try to say that Tony Thornton did not make mistakes and should not have to answer for his actions to the extent of what is true based on evidence, not rumors and lies. I am not writing this article to say that the church fire was not arson. I am not writing this article because I want to cover up the truth. I do want to know who burned down the church I loved and used to attend. I do want the community of Kountze to heal. I want to make sure government agencies and organizations using government funds are transparent and cut out waste and fraud. That being said, it is wrong for the government to target anyone they want using IRS audits and spreading rumors as part of an investigation technique. It is especially wrong for an agent to lie in order to secure a grand jury indictment. Just provide the facts and evidence and let the Grand Jury decide. Furthermore, as a former member of the church, it is just plain ridiculous to say that the church stored the paperwork and computers of the disaster relief fund. That I do know for a fact. I applaud Congressman Stockman for standing by his constituents in Hardin County and opening an investigation into the actions of the ATF and IRS handling of this situation. Again, not matter what you might think about the situation and who might have done what, it is wrong for the government to abuse their power because if they do it to one person they can and will do it to others.